Never enter a fire damaged building until the fire marshal has inspected the building and determined that it is safe to enter. Contact your insurance agent and your landlord if you rent the property. They will tell you to stay out of the building until they arrive to document the damage. If a few square feet are affected and the damage is minor, you may be able to clean it yourself using household cleaning products. 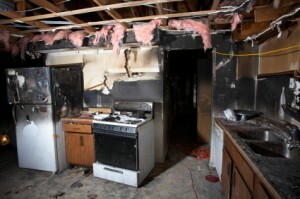 If the damage is more extensive, you should hire a professional fire damage cleanup service. They will prevent further damage to your home and possessions, and fully restore and repair your property. A fire damage repair team will also tell you which possessions can be restored and which must be replaced. In many cases, water damage is more widespread than the actual burned area. Open windows and doors, and set up fans to ventilate the area as quickly as possible. Remove wet carpets, rugs, and other textiles to a dry area to prevent mold and mildew growth. Follow these tips to minimize the damage. Place foil, plastic or wooden casters under furniture legs to avoid staining the carpet. Remove any brass or copper items and clean them immediately with a specialized cleaner to avoid smoke etching. Do not attempt to clean fire damaged carpets or other textiles with a regular vacuum. The rotating brush will grind soot further into the fibers, damaging them beyond repair. It is important to begin fire damage restoration as soon as possible to prevent any further damage. The service technicians at RestorationMasterFinder.com typically begin within three hours of your initial call. You can relax, knowing that your home and possessions will be cleaned, deodorized, and repaired by reliable, knowledgeable professionals.